Cherokee (ᏣᎳᎩ ᎦᏬᏂᎯᏍᏗ, Tsalagi Gawonihisdi) is an Iroquoian language spoken by the Cherokee people which uses a unique syllabary writing system. It is the only Southern Iroquoian language that remains spoken. "It first appears as Chalaque in the Portuguese narrative of De Soto's expedition, published originally in 1557, while we find Cheraqui in a French document of 1699, and Cherokee as an English form as early, at least, as 1708. The name has thus an authentic [sic] history of 360 years." 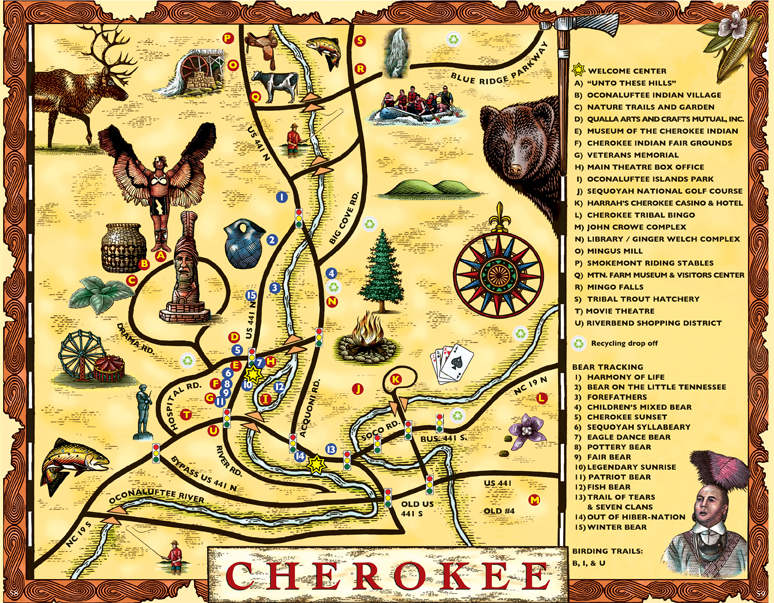 Cherokee has three major dialects. The Lower dialect became extinct around 1900. The Middle or Kituhwa dialect is spoken by the Eastern band on the Qualla Boundary. The Overhill or Western dialect is spoken in Oklahoma. The Overhill dialect has an estimated 9000 speakers. The Lower dialect spoken by the inhabitants of the Lower Towns in the vicinity of the South Carolina–Georgia border had r as the liquid consonant in its inventory, while both the contemporary Kituhwa or Ani-kituwah dialect spoken in North Carolina and the Overhill dialects contain l. As such, the word "Cherokee" when spoken in the language is expressed as Tsalagi (pronounced Jah-la-gee, Cha-la-gee, or Cha-la-g or TSA la gi by giduwa dialect speakers) by native speakers. Cherokee language is currently spoken by 12,000 to 22,000 individuals in Oklahoma and the Qualla Boundary, North Carolina. The Cherokee language may yet prove as resilient as those who have kept it alive. Older students and adults on the Qualla Boundary are also eager to improve their Cherokee, but with most fluent speakers over age 50 and numbers dying every year, there are not enough teachers. To address this, the Kituwah Preservation and Education Program is developing Cherokee-language video podcasts and interactive online Cherokee classes, promoting a venerable language with cutting-edge technology. Meanwhile, nearby Western Carolina University (North Carolina) is developing a Cherokee Language Academy. Staff members will develop Cherokee language courses and certification programs, recruit students to become language teachers, and create a Kituwah Teaching Fellows Program. Awi Uniyvsdi Kanohelvdi ᎠᏫ ᎤᏂᏴᏍᏗ ᎧᏃᎮᎸᏗ: The Park Hill Tales. (2006) Sixkiller, Dennis, ed. Cherokee Psalms: A Collection of Hymns in the Cherokee Language (1991). Sharpe, J. Ed., ed. and Daniel Scott, trans. Cherokee Vision of Elohi (1981 and 1997). Meredith, Howard, Virginia Sobral, and Wesley Proctor. The Four Gospels and Selected Psalms in Cherokee: A Companion to the Syllabary New Testament (2004). Holmes, Ruth Bradley. Na Tsoi Yona Ꮎ ᏦᎢ ᏲᎾ: The Three Bears. (2007) Keeter, Ray D. and Wynema Smith. Na Usdi Gigage Agisi Tsitaga Ꮎ ᎤᏍᏗ ᎩᎦᎨ ᎠᎩᏏ: The Little Red Hen. (2007) Smith, Wynema and Ray D. Keeter. Sources: Cherokee-nc.com; Bruchac, Joseph. Aniyunwiya/Real Human Beings: An Anthology of Contemporary Cherokee Prose. Greenfield Center, N.Y.: Greenfield Review Press, 1995. ISBN 0-912678-92-5; Cook, William Hinton (1979). A Grammar of North Carolina Cherokee. Ph.D. diss., Yale University. OCLC 7562394; Feeling, Durbin. Cherokee-English Dictionary: Tsalagi-Yonega Didehlogwasdohdi. Tahlequah, Oklahoma: Cherokee Nation, 1975; Feeling, Durbin, Craig Kopris, Jordan Lachler, and Charles van Tuyl. A Handbook of the Cherokee Verb: A Preliminary Study. Tahlequah, Oklahoma: Cherokee Heritage Center, 2003. ISBN 0-9742818-0-8; Holmes, Ruth Bradley, and Betty Sharp Smith. Beginning Cherokee: Talisgo Galiquogi Dideliquasdodi Tsalagi Digohweli. Norman: University of Oklahoma Press, 1976; King, Duane H. (1975). A Grammar and Dictionary of the Cherokee Language. Ph.D. diss., University of Georgia. OCLC 6203735; Lounsbury, Floyd G. (1978). 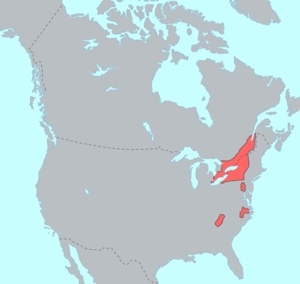 "Iroquoian Languages". in Bruce G. Trigger (ed.). Handbook of North American Indians, Vol. 15: Northeast. Washington, DC: Smithsonian Institution. pp. 334–343. OCLC 12682465; Munro, Pamela (ed.) (1996). Cherokee Papers from UCLA. UCLA Occasional Papers in Linguistics, no. 16. OCLC 36854333; Pulte, William, and Durbin Feeling. 2001. "Cherokee". In: Garry, Jane, and Carl Rubino (eds.) Facts About the World's Languages: An Encyclopedia of the World's Major Languages: Past and Present. New York: H. W. Wilson. (Viewed at the Rosetta Project); Robinson, Prentice. Conjugation Made Easy: Cherokee Verb Study. Tulsa, Oklahoma: Cherokee Language and Culture, 2004. ISBN 1-882182-34-0; Scancarelli, Janine (2005). "Cherokee". in Janine Scancarelli and Heather K. Hardy (eds.). 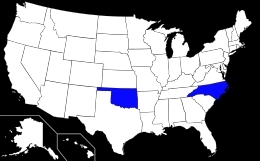 Native Languages of the Southeastern United States. Lincoln, NE: University of Nebraska Press in cooperation with the American Indian Studies Research Institute, Indiana University, Bloomington. pp. 351–384. OCLC 56834622; Scancarelli, Janine (1987). Grammatical Relations and Verb Agreement in Cherokee. Ph.D. diss., University of California, Los Angeles. OCLC 40812890; Scancarelli, Janine. "Cherokee Writing." The World's Writing Systems. 1998: Section 53.